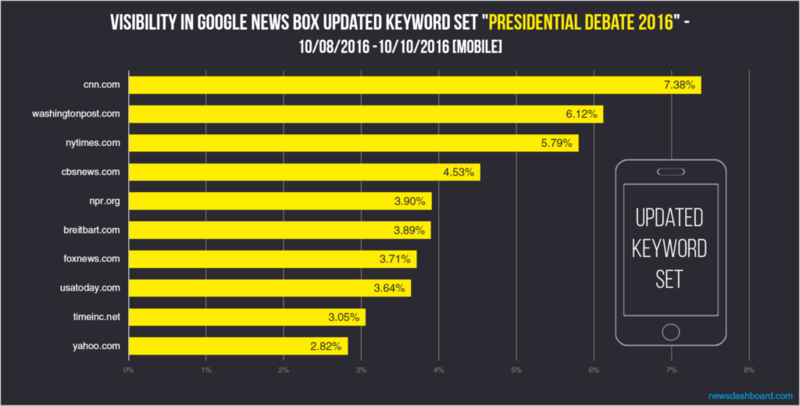 Which news publisher won the second presidential debate in Google News? After the first presidential debate cnn.com was the winner in Google News. The site had the highest visibility in the Google News Boxes Desktop as well as in the Google News Carousels and Google News Boxes Mobile. But is cnn.com still the winner after the second presidential debate? To answer this question, we take a detailed look at the Trisolute Software News Dashboard data and we find some astonishing results. We look at two different keyword sets (you can find a list with the keyword sets at the end of the text) between 2016/10/08 and 2016/10/10. In addition to the initial set of keywords, we already used for our first analysis after the first presidential debate, we decided to use a second updated one. For example, in our updated keyword set we added “Trump video 2005” or “Donald Trump’s lewd comments”, because those were very important keywords in the days before the debate. Moreover, we added keywords around fact checking. Obviously the second one is a broader keyword set so results could differ from our initial set of keywords. First of all, we look at the results of our broader set of keywords. 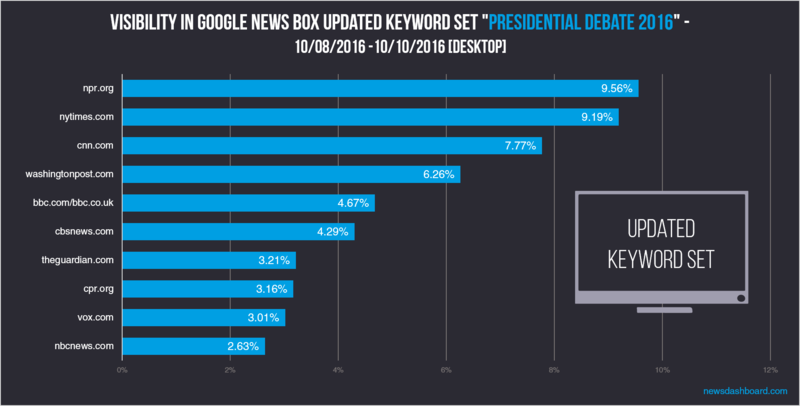 In the Google News Boxes Desktop npr.org is on first position with a visibility of 9.6 percent. On second position is nytimes.com with 9.2 percent. Cnn.com is just on third position with 7.8 percent. Considering additional keywords with a direct reference to NPR (“npr fact check”, “npr fact check Clinton”, “npr fact check trump”) in our updated and broader set of keywords Google shows us the expected result: NPR in the Top 10. When we take out the specific NPR keywords, the site is not in the Top 10 at all. However, we still decided to add those keywords, because NPR’s presidential debate fact checks proved to be very popular. Now we take a closer look at the identical set of keywords we have also used for our analysis after the first presidential debate so that we can compare the results without any bias. Obviously there are some differences: cnn.com lost a bit of their visibility in the Google News Boxes desktop. 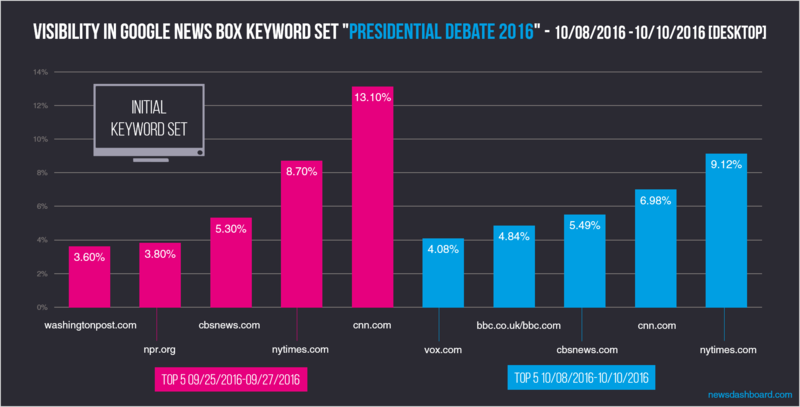 After the first debate, CNN was on first position with a visibility of 13.1 percent, but after the second debate cnn.com is still on second position with a visibility of 7 percent. Now nytimes.com is in a preferential position and reaches a Google News visibility of 9.1 percent. Let’s have a look at the mobile results. Just as before, we will first analyze the results of our broader and updated set of keywords. We can see that the mobile results differ from the desktop results. On first position is cnn.com with a visibility of 7.4 percent. On second position is washingtonpost.com with 6.1 percent. Nytimes.com, formerly second position in the desktop results, is now on third position with a visibility of 5.8 percent. Other successful news publishers in the top 10 mobile are cbsnews.com, npr.org, breitbart.com, foxnews.com, usatoday.com and timeinc.net. Yahoo.com with relatively low results in comparison to former mobile analyses. When we look at the same set of keywords we also used after the first debate, we have some different results. Cnn.com still is on first position, but the other positions have changed. As you can see in the following diagram, washingtonpost.com got hold of the second position in the Google News carousels and Google News Boxes mobile. After the second debate it had a visibility of 5 percent. 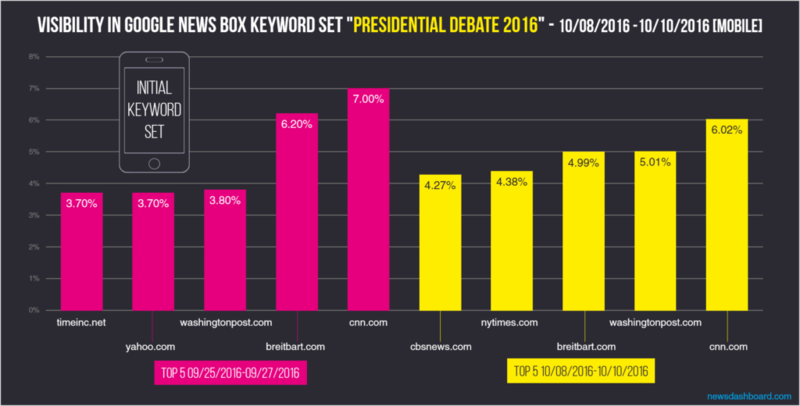 After the first debate, washingtonpost.com was on third position with a visibility of 3.8 percent. Also the nytimes.com improved: After the first debate, the site was on position nine with 3.4 percent visibility. After the second debate (and the same set of keywords), nytimes.com ranks now on fourth position with a visibility of 4.4 percent. If we want to sum up our analysis around the second presidential debate we can state the following: As desktop results are concerned nytimes.com was stepping on first place leaving cnn.com on the second place and washingtonpost.com on third. Theses publishers also dominated the results for the AMP carousels. Here cnn.com was first, washingtonpost.com second and nytimes.com third. So this time the three big publishers let no one else enter the podium. debate, debate 2016, debate 2016 live, debate time, donald trump, donald trump video, donald trump’s lewd comments, donald trump’s lewd conversation, election debate, hillary clinton, hillary rodham clinton, npr fact check, npr fact check clinton, npr fact check hillary, npr fact check trump, npr fact checker, presidential debate, presidential debate 2016, presidential debate fact check, presidential debate fact checker, presidential debate schedule, presidential debate video, second debate, second presidential debate, trump video, trump video 2005, who won the presidential debate, winner of the presidential debate.